Carnival in Rio is truly unique and there is nothing like it on the planet. Each year the Rio Carnival gets bigger and bigger as more people from around the world flock to the city for this unique experience that keeps people coming back. Up until the mid-eighties, Samba Parades took place along Ave. Presidente Vargas, upon which bleachers were built annually and taken down after the Carnival festivities had come to an end. The streets flooded with people, and for this reason, Governor Leonel Brizola decided that the main events for Carnival in Rio needed a more structured venue. In 1983 the government commissioned world-renowned Brazilian architect Oscar Niemeyer to designed the plans for Rio Carnival’s new home, the Sambadrome. In 110 days, stadium-style seating was constructed on both sides of a 700 meter (roughly half-mile) stretch of the street Marquês de Sapucaí, and on March 2, 1984, the Sambadrome was inaugurated. The Sambadrome is comprised of free-standing structure along the parade runway. A few days before the big event, the Carnival runway (or passarela) is painted white. At the end of the parade route is a complex called Praça da Apoteose, or Apotheosis Square, which is made up of a set of bleachers that create a square in which parade participants can gather as their school’s procession comes to a close. With an initial capacity of 70,000 spectators, when Rio won the bid for the 2016 Summer Olympic Games it was agreed that the venue needed to raise its capacity. 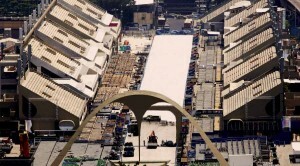 Plans were underway to renovate the Sambadrome according to Niemeyer’s initial symmetrical design, which was modified in 1984 in order to accommodate an old factory nearby. The city reached an agreement with the owners of the Brahma Brewery, which was demolished in order to add more bleachers, increasing the seating capacity of the Sambadrome to 90,000. The long Sector 2 was replaced by Sectors 2, 4, 6, and 8, and are located directly across the parade runway from Sectors 3, 5, 7, and 9. Not only were 12,500 new seats added to the stadium but acoustics improved dramatically, visibility for certain sectors was enhanced, the venue was made more aesthetically pleasing as a whole, and balconies were added to the boxes located on the even side of the Sambadrome. By early 2012 the renovations were complete just a few days before Carnival. A grand re-opening ceremony took place on February 7, 2012, with architect Oscar Niemeyer, then 104 years old, and Rio’s Mayor Eduardo Paes in attendance. See the Sambadrome come to life by booking your Sambadrome Parade tickets today on RioCarnival.net! Can I bring food into the Sambadrome? I read that most seats are concrete bleachers: can I bring something to cushion my seat? Are there bathrooms in the Sambadrome? Can I take pictures or videos at the parade? Is it safe inside the Sambadrome? What am I NOT allowed to bring into the Sambadrome? Are there special locations for persons with disabilities in the Sambadrome? What do I need to do to parade with a Samba School? What should I wear under my costume? What time to the doors to the Sambadrome open? Where can I purchase I costume to participate in the Rio Carnival Parade? Can I wear my costume before the parade? When should I get to the Sambadrome if I am parading, and where should I meet my school? Is there anything I should practice before the parade? When I am done parading, what do I do with my costume? How long will I be parading for? what section do the judges sit? we will be arriving by cruise ship in 2018 staying from Feb. 11 through Feb. 13th. My mother will be 82 and uses a wheelchair so we would need the accessible seating area (a place for her and myself). I see mentioned about tickets being of no charge for this area. Would foreigners be able to access these tickets and how? Mom really loves exotic cultures and loves to be where the action is so I think this will be right up her alley!! thanks for your assistance!